Vermonters, or any Americans, who are curious about Cuba should travel to the Montréal Museum of Fine Arts before June 8 to see the most comprehensive exhibit of Cuban art ever assembled outside the island nation. This exhaustive retrospective - entitled "Cuba! Art and History From 1868 to Today" - may never arrive at an American venue, owing to the nearly 50-year policy of "protecting" U.S. citizens from the ideas and images of the Cuban revolution. More than 100 artists created the 400 works on display in a variety of styles and media. Occasionally dazzling and self-consciously monumental, the show took three years to organize. Chief curator Nathalie Bondil traveled to Havana on eight occasions to arrange loans from Cuba's Museo Nacional de Bellas Artes. Private collectors in New York and Miami also lent works, as did the Museum of Modern Art in Manhattan and other institutions in the United States and Europe. It was the sheer magnitude of the undertaking that made the process so time-consuming - not bureaucratic hassles from Cuba's communist government. Unlike the United States, Canada maintains friendly relations with Cuba, which proved eager to have its artistic heritage showcased in North America. And, as the exhibit demonstrates, Cuban authorities have sanctioned visual innovation more than some other forms of expression. The theme of artistic freedom vs. ideological rectitude is not explicit in "Cuba! Art and History." But it can't be far from the minds of visitors as they view the numerous romantic visions of heroic guerrillas from the 1960s and the few contemporary pieces that hint at dissent. And what about those modernist paintings from the 1920s, '30s and '40s? Did the Castro regime regard them as bourgeois self-indulgences? Not at all, according to the show's 424-page catalogue and the imposing text panels that hang in every room. Fidel is famously quoted in this regard: "Our enemies are capitalism and imperialism, not abstract art." It's true that revolutionary Cuba never insisted on adherence to the Socialist Realism style that reached its zenith in the Soviet Union. There are images of downtrodden workers and gloating exploiters in the show, but they date mainly to the Depression era, when such agit-prop art was being produced in the United States as well. Another of Castro's axioms, also cited in the show, is more menacing: "Inside the revolution, everything; outside the revolution, nothing." The works on display in Montréal pose few disconcerting questions to the Marxist-Leninist authorities. But, while it's clearly sympathetic to the revolution, the show does not favor politics over aesthetics. In fact, the most interesting of the exhibit's five historical sections are the three that cover the 90 years prior to Castro's takeover. Paintings with anti-colonial content are included in these initial segments of a survey that begins, not arbitrarily, in the year of an uprising against Spanish rule: 1868. The most melodramatic example is Augusto Garcia Menocal's "I Don't Want to Go to Heaven." This epic-scale canvas, completed in 1930, shows a 16th-century Taino rebel standing nobly at the stake as conquistadors and a priest prepare to immolate him. The accompanying text explains that this native warrior supposedly uttered the words of the painting's title after being told there would be white people in heaven. Cuba's rich African heritage is also explored in the pre-revolutionary sections of the show. And, to the curators' credit, the sampling of works pertaining to Afro-Cubans has not been sanitized. In "When Nobody Is Around," a pair of panels from circa 1880, Victor Patricio Landaluze portrays two black servants in racist poses. A maid preens clownishly in front of her mistress' vanity mirror, while a butler distends his oversized lips to smooch a bust of a white woman. The show takes a turn at star-making in the case of a previously obscure Cuban artist, Marcelo Pogolotti (1902-1988), whose career bracketed the Second World War. His politically inflected fusion of Surrealism and Futurism does have an appealing originality. But viewers' attention may be drawn to a pencil-and-gouache piece in a corner more than to the oils that dominate the room devoted to Pogolotti. In this small work, a profile of Hitler is accompanied by what appears to be a row of marching penises. The reputation of Wilfredo Lam (1902-1982) requires no such pumping up. The son of a Chinese father and Afro-Cuban mother, Lam is known internationally for a distinctive style developed during the decades he lived in Spain and France. 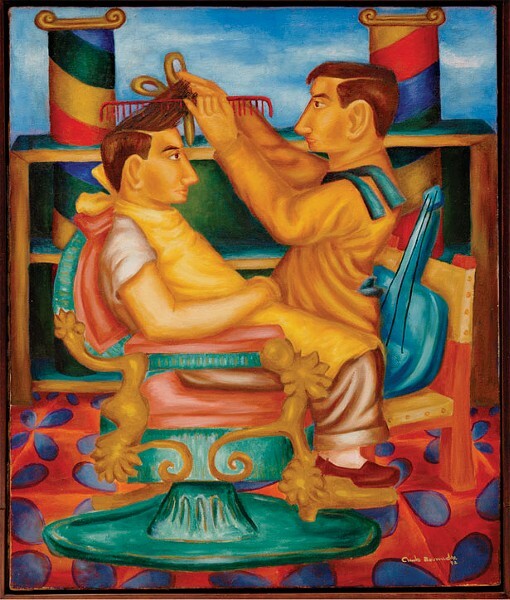 While the influence of Picasso, Kandinsky and other European modernists can be discerned in Lam's work, it nonetheless stands as one long exploration of cubanidad, or "Cubanness." The painstaking search for national identity is evident throughout the Montréal exhibit, as generations of artists sought to give visual form to a culture that melds the Old and New Worlds with Africa - all in a historical context of vicious repression and unyielding resistance. Lam was also the orchestrator of a giant mural installed on a separate floor of the museum. While living in Havana in the 1960s, he arranged for 100 Cuban and European artists to contribute to "Cuba Colectiva" (1967), which uproariously celebrates this very Caribbean revolution in a swirling spiral of multicolored images. Americans ashamed of their country's role in Cuba's degradation - documented here by 1950s photos of sun-bathing tourists and revelers in Havana's Mafia-run casinos - can take pride in a different set of photos presented in slide-show form. Walker Evans, best known as a chronicler of social injustice in Alabama, recorded similar subjects and scenes in Cuba during the 1930s. The American photographer's images of everyday life in Havana depict a gritty city writhing under a dictatorship that's oblivious to its impending doom. Mention must be made of two pieces by Lazaro Saavedra, a 44-year-old son of the revolution brave enough to be critical of its Orwellian excesses. "Ideology Detector" might initially be confused with one of the humidity gauges that hang on museum walls. Saavedra's dial instead measures degrees of fealty to revolutionary doctrine; its arrow points to a span labeled problematica. Nearby, a video screen divided into four panels shows pairs of eyes in a shifting series of suspicious glances. Cubans would readily read Saavedra's "Suspicion Syndrome" as a commentary on the snooping Committees for the Defense of the Revolution that monitor political behavior on a block-by-block basis throughout the country. Despite its sometimes ponderous pacing, "Cuba! Art and History" tells the fascinating life story of an island that lies only 90 miles from Florida but might just as well be, politically speaking, 90 light years from insular, paranoid America. "Cuba! Art and History From 1868 to Today," Montréal Museum of Fine Arts. Through June 8. See website for more info.